La Flora Organics brings to you 100% natural and handmade face care pack enriched with 14 herbs.This skin rejuvenating face pack helps detox, detan ,cleanse your face giving you an instant youthful glow. An all herbal ,tried and tested formulation face pack that rejuvenates your skin naturally in minutes. Handcrafted with love & care using specially handpicked and naturally dried 14 herbs that can give an instant youthful radiance to your face. This pack exfoliates your skin to remove pollutants, dirt and greasiness deep from the skin pores. It also nourishes the skin, refines and tightens your skin making it firm, soft, supple and youthful. 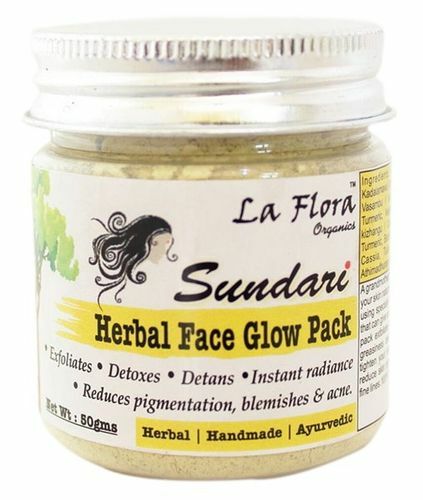 With regular use Sundari Herbal Face Care Glow Pack helps to reduce skin pigmentation, clears blemishes, wrinkles & fine lines.